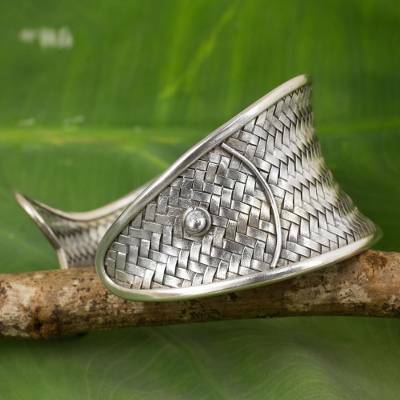 Handmade Silver Fish Shape Cuff Bracelet Hill Tribe Jewelry, "The Wide Fish"
Karen hill tribe artisans ingeniously weave sterling silver to resemble the scales on a fish for this bracelet. Proudly presented by Achara, the cuff is crafted by hand in Thailand. You can find silver cuff bracelet 'The Wide Fish' by Achara in jewelry categories such as Hill Tribe Bracelets, No Stone Bracelets, Fine Silver Bracelets and Cuff Bracelets. Enjoy exploring these sections for other Novica treasures. Every time I wear your bracelet I feel special! I generally buy gifts for others on Novica but saw this bracelet for me. Took a risk and so glad I did as it is well worth the price. It is surprisingly light weight and it is flexible so you can adjust it to your wrist. Can wear it fish face up or fish face down and have simpler cuff look with the weave showing for just enough interest. If your wondering about getting this piece, do so you will be happy. The woven metal looks great as a design and has whimsy as fish scales. I like the bracelet because it is not a simple cuff while still having a simple shape. "Exactly as I expected !!" I absolutely love my fish cuff bracelet! It fits perfectly and is light enough to wear 24/7. The craftsmanship is impeccable. I am going to really enjoy showing this off to friends and family because it is so unique! It is a awesome piece of jewelry!! I get compliments all the time! !